Here is a list of some of the species you could run into on any given flats/backcountry fishing charter out of the Florida Keys and specifically Key West. The Silver King. 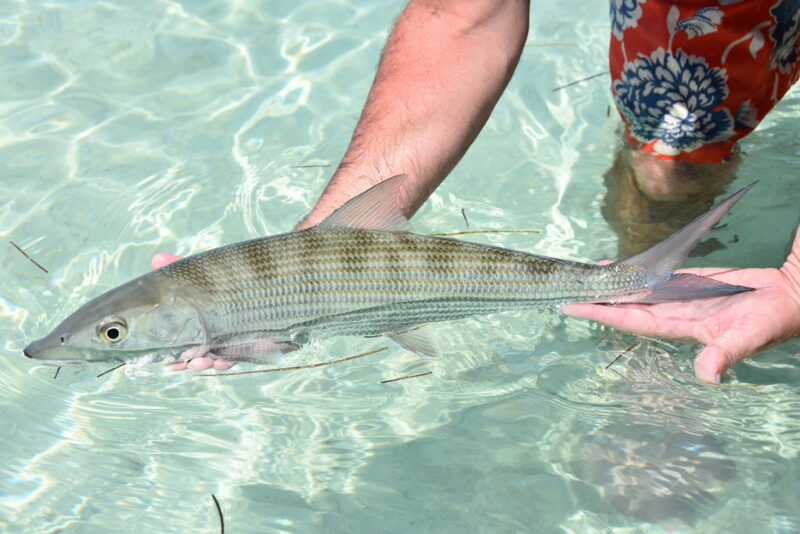 These fish roam the flats and backcountry of the Florida Keys all year round. The best time of year is March-July for “tarpon season”. Averaging 60lbs they are no joke. Make sure to book your tarpon charters in advance. They give great areal displays when hooked and are known to put up an incredible fight. The holy grail of flats fishing here in the Lower Keys. 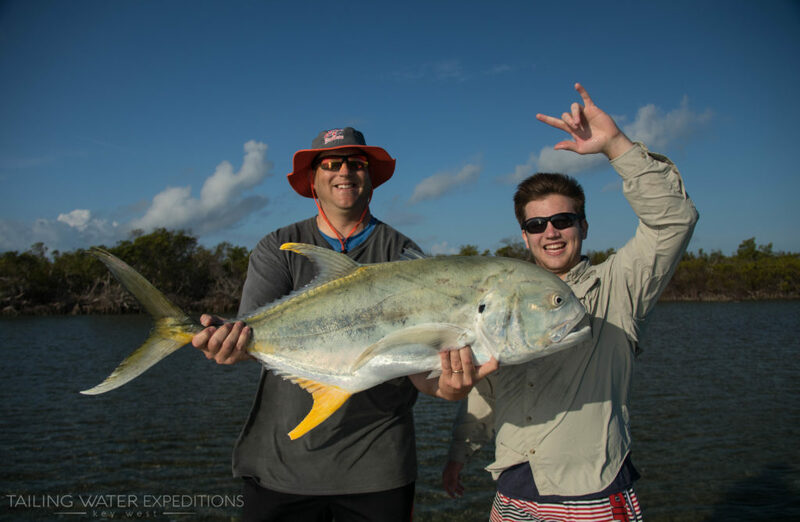 The permit is arguably one of the most sought after sportfish in the world. Big, strong fighting fish that are traditionally caught while sight fishing in shallow water. Be warned they are quite wary, so bring your A-game. Dedication to the hunt and an accurate cast are essential. 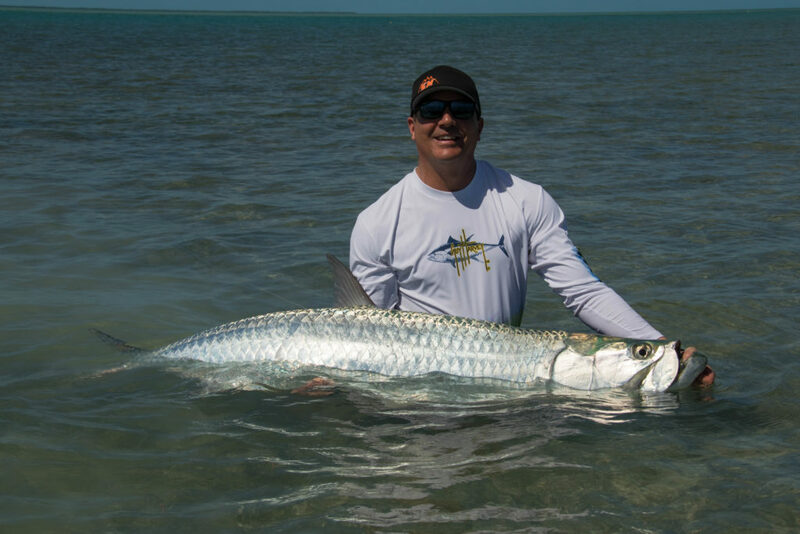 Another sought after sportfish here in the shallow waters of the Lower Keys. 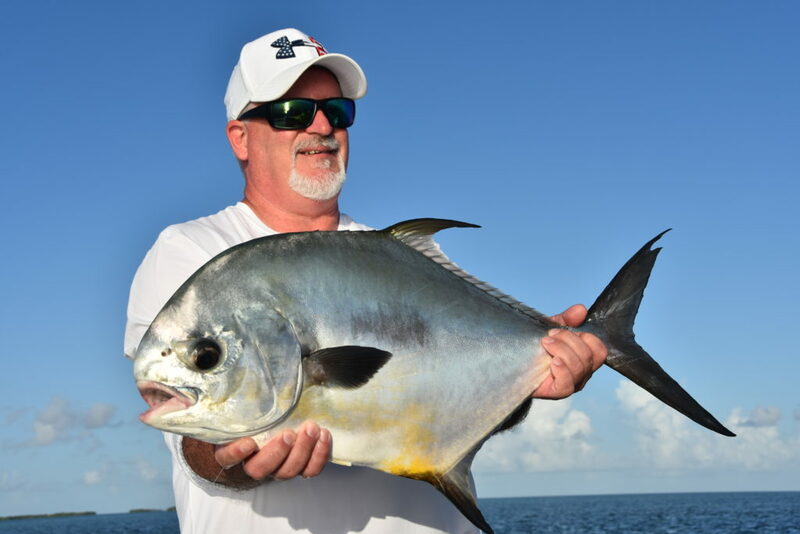 Like the permit, these fish are traditionally caught while sight fishing in shallow water. Incredible fighters for their size, I have seen large bonefish empty 70 yards of line in a couple of seconds. They are favorite target for fly anglers and any shallow water enthusiast. 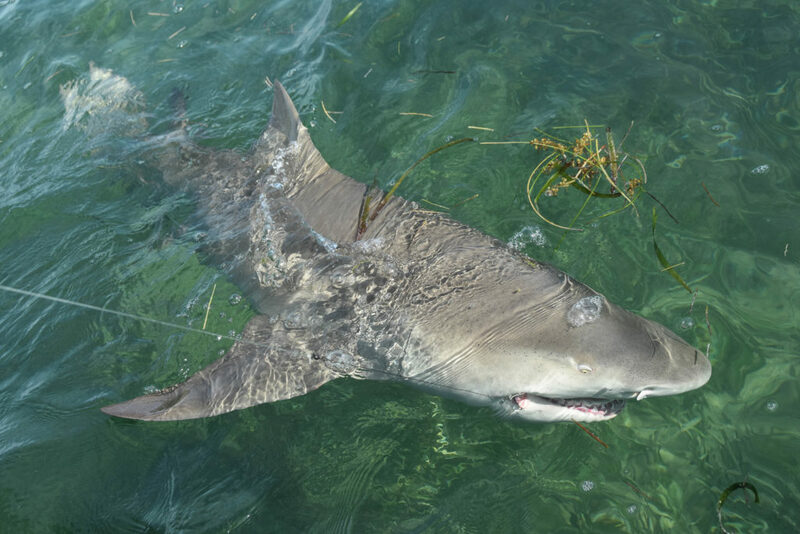 Lemon Shark – Probably our most common shark swimming around out on the flats. These guys can be found belly crawling over the seagrass in one foot of water- it’s a pretty cool sight with their fins sticking out of the water like a scene from Jaws. They aren’t scared to go into the shallows in search of food. They can range anywhere from 2-9 feet long, but the average size is about 5 feet. With long drag screaming runs and impressive head shakes, these sharks are a blast to catch in the shallow waters. Bull Shark – These fish do not need any introduction. Easily getting up to 10+ feet long and weighing up to 500lbs, the bull shark is king of the playground out here in the Lower Keys. They come inshore to spawn in the springtime and can be found all over the place. Late February through March (and into April) show us some of the largest sharks I have ever seen. The bull shark becomes quite a nuisance this time of year for us chasing around the mighty tarpon. They will eat a 60lb tarpon like a potato chip. Nurse Shark – The nurse shark can be found all over the Keys. They are very opportunistic predators and feed primarily on crustaceans and small fish. While most fish and sharks need to keep swimming to breath, nurse sharks can remain motionless on the sea floor and pump water through their gills. Adults can reach up to 14 feet (typically in deeper water) and weight over 300lbs. We find them up on the flats in channels, swimming around patch reefs and other areas with live bottom. Blacktip and Spinner Sharks – Almost one in the same, these two species of sharks are some of the hardest fishing sharks we have. Drag screaming runs can find us chasing them down with the boat. I’ve seen some of the bigger blacktips dump out 300 yards of line in seconds. Averaging anywhere from 2-6 feet long, hooking into one of these sharks is always a good time. They will typically jump and spin out of the water after being hooked which is quite an impressive sight. Hammerhead Sharks – I have admit these are my favorite sharks swimming around the ocean. They are so cool looking. We don’t run into the Hammerheads as often as some of the other shark species, but it is always a welcome treat. 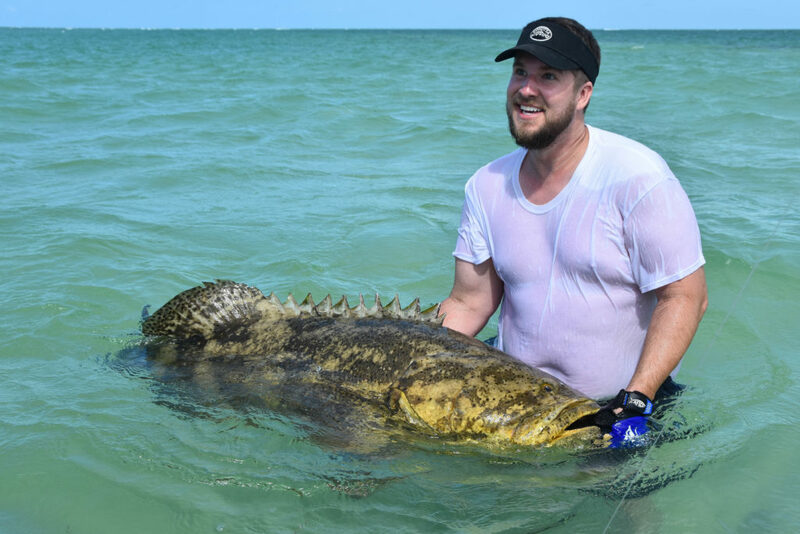 Growing up to over 15 feet long and weighing over 800lbs – these fish get massive! Huge dorsal fins can give them away when feeding and I’ve seen them splashing around from a half mile away. Just like the bull sharks these fish can become a bit of a nuisance during tarpon season. Once a hammerhead locks onto a tired tarpon he will usually get him. We do our best to give our tarpon some backup during a shark attack, but sometimes there is not much we can do. Bonnethead Shark – Usually found up on the flats. We run into these cool sharks all the time when looking for bonefish and other shallow water species. They are suckers for any kind of crustaceans and will pounce all over a shrimp tipped jig. They are great “bonefish practice”. Sometimes mistaken for a baby hammerhead shark, a full grown bonnethead will only grow to about 3 feet long. Offering blistering runs on light tackle. Sight fishing bonehead sharks on the flats is a blast and very rewarding. Atlantic Sharpnose Shark – These sharks are typically on the smaller side. Adults only get up to 4ft long, but their mouths are still full of razor sharp teeth! We will catch these sharks on smaller live baits and smaller pieces of cut bait. Hard fighting and not a common catch, the sharpnose shark is always welcome on our shark fishing charters. The mutton snapper has got to be my favorite snapper to catch here in the Florida Keys. They have an incredible coloration and put up a great fish on the light tackle rods we use. Some of my favorite baits to use are live pinfish and crabs as well as a variety of artificial lures such as bucktail jigs and lip plugs. Getting up to 12+lbs in the backcountry and even bigger offshore, I always get excited when these bad boys get to the boat. The mutton snapper also makes great table fair. Must be 18″ total length to keep. 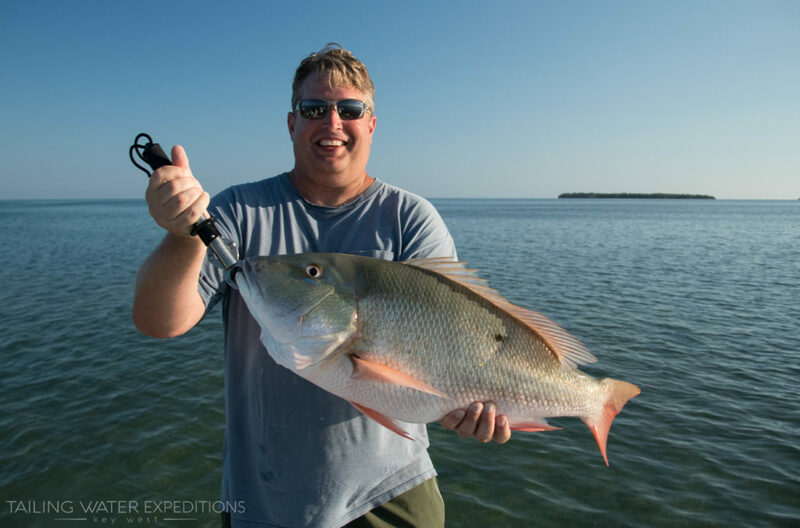 Mangrove snapper play an essential role in backcountry fishing. Good fighters and great table fair, these guys make up a huge portion our fun fishing. Averaging anywhere from 1-4lbs in the backcountry, but can get up to 10+lbs offshore. Easily taken on bait, lures, and flies, a lot of people’s first fish will be a mangrove snapper. I know mine was! Must be 10″ total length to keep. These fish are one of the first to come to mind when someone says fishing the reef. Strong fighters and great on the dinner plate. Yellowtail snapper are very sought after here in the Keys and certainly a staple in the fishing community. Average size is 1-4 pounds, but can get up to 10lbs. We do get some in the backcountry and certain areas inside the reef. Must be 12″ total length to keep. Typically on the smaller side, but still excellent table fair and fun to catch on light tackle. The lane snapper has beautiful coloration and also has a “false eye” on its tail, like its bigger cousin the mutton snapper. Must be 8″ total length to keep. These are not very common in the backcountry, but are always a welcome sight. Beautiful coloring with a yellow reddish tint and vertical bars, the schoolmaster typically doesn’t get very large, but is still a fun fish to catch. These brutes are still protected from harvesting, but they sure put up an incredible battle! Averaging anywhere from 10 – 300+lbs these monsters are always an impressive catch. We can target the juveniles in the beautiful mangrove estuaries and the bigger goliath grouper will reside over shallow water structures and ledge systems. These are some of the more popular grouper that we come across. We typically find them while fishing patch reefs and bottom fishing bigger channels. Eager to eat a variety of artificial lures and baits, these guys are a lot of fun. They pull hard and must be 20″ in total length to keep in grouper season. The gag grouper is a little bit smarter than the red grouper and sometimes harder to trick. But we also find these fish while working patch reefs and sometimes find some big ones in deeper mangroves island channels. They must be 24″ in total length during grouper season to keep. These bad boys can get pretty big and are one of the hardest grouper to catch here in the Florida Keys. They can be taken with some consistency in deeper water, but they do not make their way into the backcountry very often. Like the gag grouper, they also have to be 24″ in total length during grouper season. These fish are one of the hardest fighting fish for their size swimming in the ocean. The Jack Crevalle is very aggressive and will eat almost anything in sight. Watching a school of them fight over a top water plug sure is a sight to see. They are very common to come across in the backcountry and on the flats off of Key West. A very popular target for some great rod bending action all year long. Average size is anywhere from 2-8lbs but they can get a lot bigger! Being in the jack family, these fish can certainly hold their own. Getting up to 20lbs in the backcountry these fish have definitely been known to pull some drag. Eating live bait and a variety of lures, the yellow jack is always a cool catch. 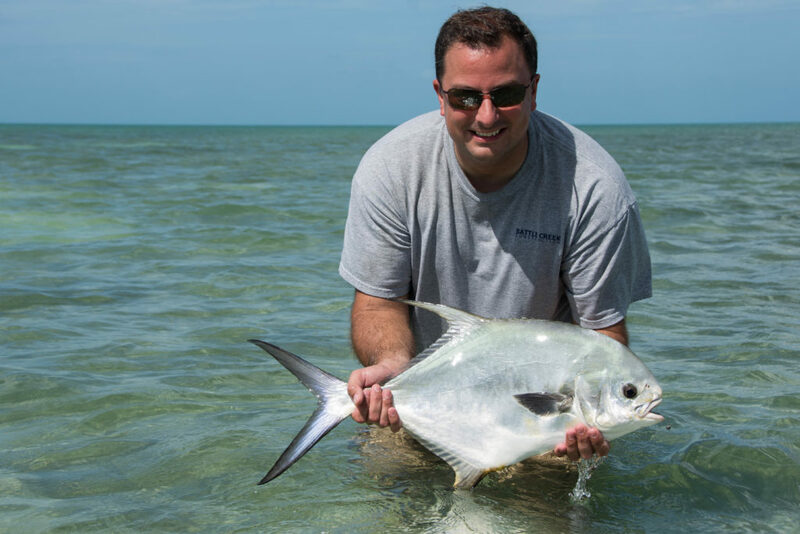 The pompano is typically a winter and springtime catch here in Key West. They are great eating and known for putting up a good fight. Certain areas will have schools of them at the right time of year. We also catch them drifting certain areas in the backcountry basins. I gotta give it to these fish, they are one of the hardest fighting fish for their size that I have came across. Typically only 1-2lbs, they do patrol the backcountry and surrounding water all the way out to the reef. They are caught on small jigs and will hop all over a small fly. These guys look almost identical to a jack crevalle, but have a slightly bigger eye and are not as narrow. They typically do not get bigger than five pounds in the backcountry and it may be hard to tell them apart at first glance, but they are still a blast to catch on light tackle. The bar jack will look similar and be relative in size to the blue runner. They both fish incredibly hard for their size, but the bar jack will have a bright neon blue bar running across the top of its body from behind its eye to its tail. Oh my what teeth you have. There isn’t another fish in the Keys that has a more impressive dental record. 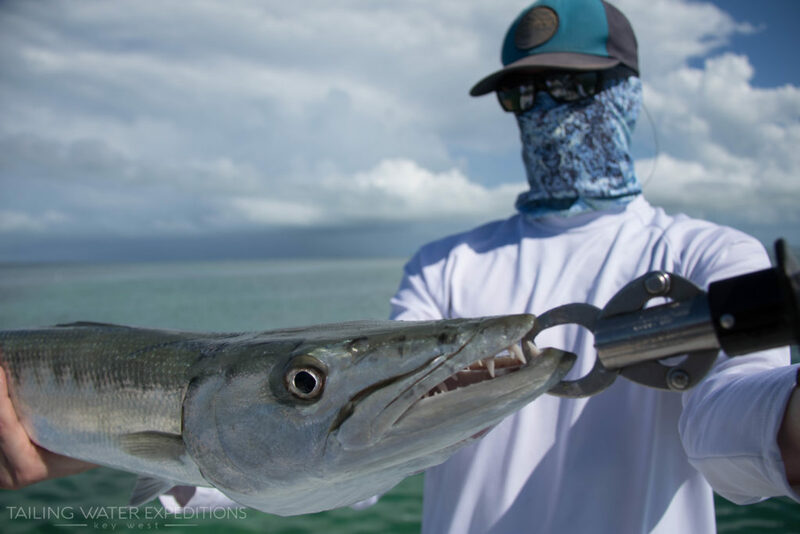 The barracuda is no stranger to most of us and is fortunately becoming a very popular inshore gamefish. Growing to over 20lbs on the flats and an explosive personality makes them one of my favorite targets in the backcountry. The barracuda fishing is great all year long, but in the wintertime it is out of control! They will destroy top water plugs and hop all over a well-placed fly. The best time of year to get into these fish is in the winter. The cooler water allows these aggressive fish to fill in areas of the backcountry. The sea trout is great on the dinner plate and a fun catch. We usually catch them mixed in with schools of ladyfish and jack crevalles. The Cobia is always a welcome catch. We will typically find them in the backcountry off of Key West in the winter and spring. My favorite way to catch them is to sight fish them off of big spawning bull sharks in the springtime. It can be a blast. The cobia is excellent on the dinner plate and can easily get up to 40lbs in the backcountry. 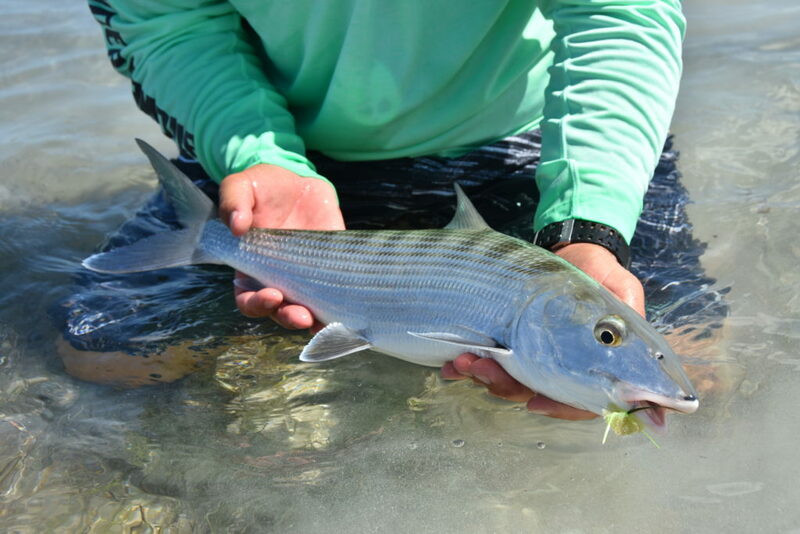 We have a couple of different types of porgy here in the Keys. Commonly caught while bottom fishing, these fish are a great fight and excellent table fair. Average size is 1-3 pounds in the backcountry. Cero, Spanish, and King Mackerel are the 3 most popular species of mackerel found in the Lower Keys. Filling up the backcountry and surrounding waterways in the wintertime, don’t count out these guys to bend a rod. They are sometimes seen “skying” up to 15 feet out of the water while chasing bait. 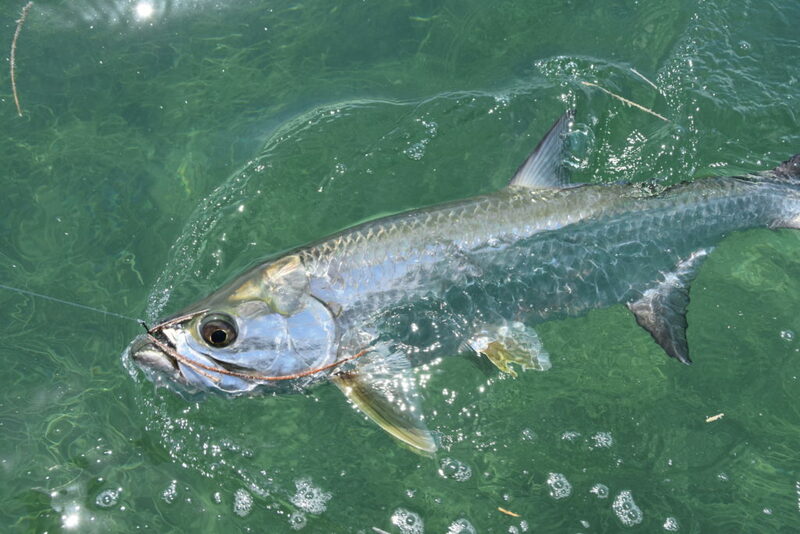 The ladyfish (nicknamed the poor man’s tarpon) is a blast to catch on light tackle. They are famous for the acrobatics and put up a good fight. The ladyfish is very aggressive and can be caught using all different types of tackle. A popular catch out in the backcountry, the ladyfish is a great target for anyone wanting to feel a fish on the end of the line. The Hogfish has to be one of my favorite fish to eat down here in the Keys. Nice white flaky meat and no fishy flavor, it doesn’t get any better ladies and gentlemen. Sometimes caught on a rod and reel, but most commonly harvested by spearfishing. Found on the reef line and inside around patch reefs and areas in the gulf. Key West is not known for their Snook and Redfishing. There just aren’t that many here. It has a lot to do with the salinity in the water, but it is not unheard of to come across some especially the further up the Keys you go. It is not something we can target on a day-to-day basis unfortunately, but we trade in snook and redfish for other shallow water sportfish like permit and bonefish.